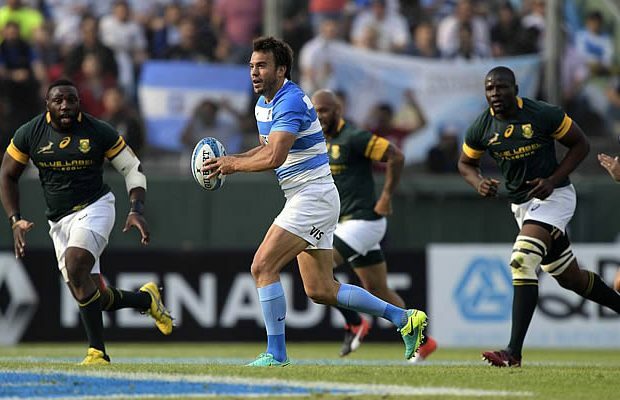 Argentina’s Pumas earned a historic first ever victory over South Africa by beating the Springboks 26-24 in a Rugby Championship match in Salta. Argentina beat South Africa in Durban in the Rugby Championship last year but this is their first on home soil and their third victory in the Rugby Championship. South Africa looked to have snatched the victory five minutes from time with a late Morne Steyn penalty but Argentina won a penalty back and Santiago Gonzalez Iglesias held his nerve and kicked Argentina to the victory. South Africa and Argentina are now level on five points in the Rugby Championship with New Zealand on top and Australia fourth. Argentina were on top in the first half and deservedly held a 13-3 lead but the Boks produced an improved performance after the break to stake their matchwinning claims but still came up short in the end. The opening 10 minutes was a stop-start affair with Argentina securing more possession during this time. They mixed up their attacks forward-driven surges and crisp inter-passing moves along the backline but the Boks defence stood firm. The Boks initially held the upper hand at scrum time but Argentina showed improvement later on and they did well from a 17th minute set-piece to breach the defence but leftwing Manuel Montero lost the ball as he dived for the tryline, in much the same way as centre Lionel Mapoe lost the ball in their opening encounter at Nelspruit last week. Argentina prop Ramiro Herrera was sin-binned for a late and no-arms tackle on Bok loosie Francois Louw and flyhalf Elton Jantjies goaled the resultant penalty in the 21st minute. Three minutes later, however, his opposite number Nicolás Sánchez opened his side’s scoring account to restore the stalemate with a penalty. Argentina grabbed the initiative in ensuing play and worked the ball out wide in the left channel to good effect until Bok lock Eben Etzebeth scrambled well to push outside centre Matías Orlando into touch with the tryline at his mercy in the 27th minute. It was a lucky let-off for the Boks but moments,after Sánchez was on target with a second penalty Argentina, ran the opposition ragged and fullback Joaquín Tuculet was able to dot down the first try of the match. Sánchez converted for a 13-3 lead which remained intact by the time Frenchman Jerome Garces brought an end to the first-half proceedings. 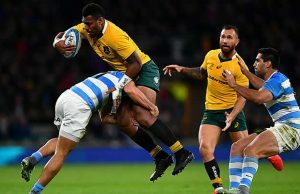 The Boks returned for second-half play with a far greater sense of urgency and their efforts paid off just five minutes later by which time they were able to wipe out the 10-point deficit. First Jantjies goaled a penalty (42nd minute) and then leftwing Bryan Habana rounded off a team effort splendidly for the Boks’ first try. Fullback Johan Goosen added the conversion and the 10-point burst allowed the Boks to draw level at 13-all. But Argentina responded almost immediately to regain the lead and a well-placed crossfield kick by winger Juan Martín Hernández was deftly collected by flank Juan Manuel Leguizamón despite a desperate try-saving tackle by Habana. Hernandez’s conversion was on target and six later he struck again from the kicking tee with a penalty to push Argentina’s lead out to 23-13. The raft of changes as the Boks started to introduce their substitutes seemed to inject new life in their ranks and they were on the verge of coming good just past the hour mark but centre Damian de Allende was dispossessed just short of the line. 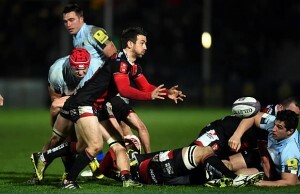 Substitute flyhalf Morné Steyn did offer a measure of reward when he landed a 64th-minute penalty. The momentum remained the Boks as they set out to wipe out the deficit and forwards and backs dovetailed splendidly in a surge from 22 metres out before substitute Pieter-Steph du Toit steamrolled his way over. Steyn failed with the conversion attempt, leaving the Boks trailing by two points after 68 minutes. A passage of frenzied play followed with Steyn regaining the lead with a penalty but the South African’s joy was short-lived when Argentina substitute Santiago Gonzalez Iglesias struck back with what proved to be the matchwinning penalty. Next week the teams have a bye but they will return to the Rugby Championship on the 10th of September when the All Blacks host Argentina in Hamilton and Australia host South Africa in Brisbane. Tries – B.Habana, P.du Toit.